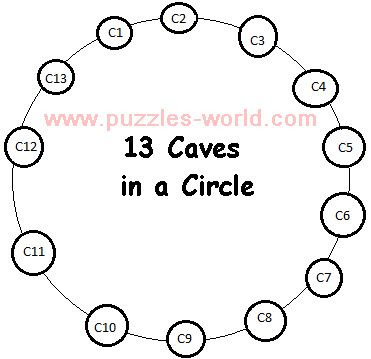 There are 13 caves arranged in a circle. There is a thief hiding in one of the caves. Each day the the thief can move to any one of of the caves that is adjacent to the cave in which he was staying the previous day. And each day, you are allowed to enter any two caves of your choice. 1. Thief may or may not move to adjacent cave. 2. You can check any two caves, not necessarily be adjacent. 3. If thief and you exchange your caves, you will surely cross at some point, and you can catch the thief immediately. Then on next day, 1 person moves Clockwise and another moves anticlockwise. So it would take a maximum (minimum guarantee) of 7 days to catch the thief.